This machine is working by the microwave to dehydrate the fruit. The processed fruits can keep the nutrition and freshness longer, the flavor and overall size are both changed in the meanwhile. 1. This fruit dryer is made of stainless steel with the standard of food security. 2. Processing the fruit by microwave can achieve drying and sterilize simultaneously, thus improving the quality of the products, and making the fruits safe and sanitary to eat. 3. 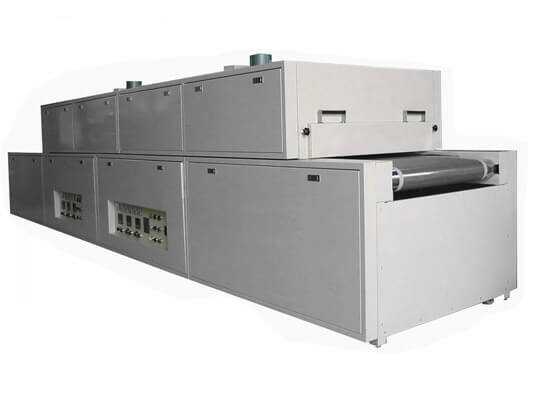 The microwave fruit drying machine is extremely efficient and energy-saving. 4. The PLC touch screen controlling system and the human-computer interface makes the fruit dryer easy to operate and labor-saving. 1. Selective heating ensures even heating and even drying. 1. Properly stored and frozen, dried fruit will keep well in your freezer for up to 12 months. 2. Remove dried fruit from its original packaging. If you dried the fruit yourself, make sure that it is completely cooled before you freeze it. 3. Separate the fruit into individual serving sizes and place each serving in a freezer bag. Be careful to squeeze out as much air as possible when sealing the bags. Label and date each bag. 4. Place the bags in a vapor-proof, moisture-proof freezer container. 5. Store the container in your freezer at no higher than 0 degrees F.